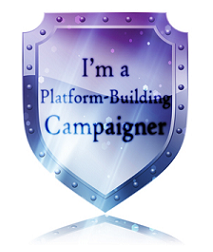 The Writers’ Platform Building Campaign, hosted by Rach Writes, is cool way for writers and active bloggers to reach out and network with other like-minded people, thus building our own platforms and helping others to build theirs. The Campaign runs from August 22nd to October 31st and will include three Campaigner Challenges, the last of which I’m posting TODAY! Just for fun, see if you can involve all five senses AND include these random words: “synbatec,” “wastopaneer,” and “tacise” (these words are completely made up and are not intended to have any meaning other than the one you give them!). The steady cry of complaining seagulls conveys her mood perfectly: Ugh. The sun has yet to clear the horizon, but she’s awake. Wait—not just awake, because that wouldn’t be so bad. Nope. She’s out of bed, dressed, and… exercising? She is not a runner. She’s barely a walker, and never before coffee. But here she is, huffing and puffing, trying not to become fed up with the monotony of one foot in front of the other. Synbatec, wastopaneer, tacise… Mentally, she reviews SAT words in an effort to stay upright. Because when your smiling voice called a smitten girl to invite her out for an impromptu weekend run, she couldn’t decline. Even if that run was scheduled for an ungodly hour. Even if her athleticism is severely lacking. Even if sweating in the presence of a cute boy is, like, the Eighth Deadly Sin. The torturous jog continues. Together, you pass a washed-up fish, silvery scales dulled, smothered with flies. She catches a whiff of rot. Even though her stomach turns over, she resolves to keep her mood from plunging completely. The sleepiness, the exertion, the fish—ick!—they’re worth it, because you’re huffing and puffing right next to her. Somehow, though, you make huffing and puffing look good. “Ready for a cool down?” you ask, slowing to a walk. Is she ever! She flashes you a grateful smile and dabs her glistening brow oh-so delicately. You lead her to the pier and, thoughtfully, pull her hood up to ward off the morning chill. She smiles; now she matches you. Though she’s all-too aware of why she’s here—exercise? No way!—she keeps wondering why you invited her. But when you lean in to kiss her, the sun crests the horizon, gloriously bright, and she knows. I know! I’ve discovered that flash fiction is the perfect opportunity to experiment with things like tense and POV. Second person was tricky for me, but fun too! Katy! This is awesome! I love it so much! And I love the POV. So much fun. I like the way you took this challenge. I, as I’m a lover of a little romance, the ending is my favorite 🙂 Great picture to go with it too! I really like it when a writer takes on the second person POV. 🙂 Love your entry! Even if sweating in the presence of a cute boy is, like, the Eighth Deadly Sin. This was awesome, as always. 🙂 You’ve got my vote. This is really super cute. Well written and just outstanding. Great job, I liked it! Nice entry! I love the ending. I love the romance of it and the way she catches a whiff of rot. Second person POV! I am impressed. I like the parameters and I love what you did with them. Love the eighth deadly sin! Fantastic line. Beautiful atmosphere in this piece. Love the ending. Hey I’m supposed to tell you that you’ve moved on to the next round of judging. Congrats. Oh, cool! Thanks for letting me know, Mel!